Sponsors of this year’s East Lancashire Hospice Bubble Rush are bubbling with excitement about this year’s foamy event. On Saturday 27 April the Bubble Rush will return to Pleckgate High School’s grounds in Blackburn. 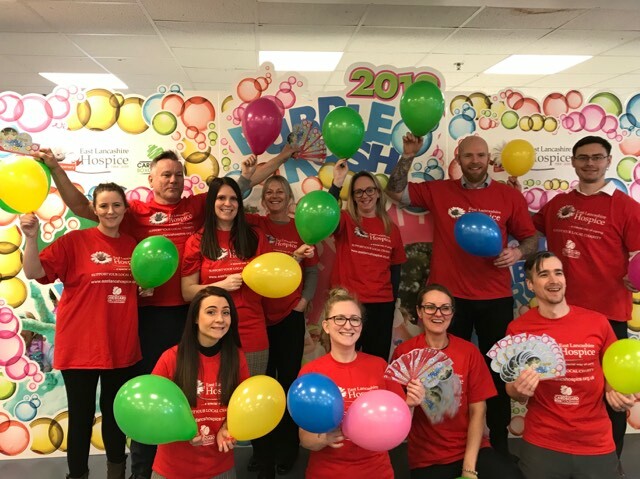 Following the success of last year’s event, East Lancashire Hospice is hoping even more people will join them to run through the four coloured bubble stations and help raise money for patient care. The event, sponsored by the Cardboard Box Company in Accrington, has already sold more tickets than last year with a limited number of discounted early-bird tickets available. Ken Shackleton, Managing Director of the Cardboard Box Company, said: “Last year we sponsored the event. A number of employees from our factory took part and had a great time and raised money for East Lancashire Hospice. The company has supported the hospice for a number of years. Last year the company was bought by The Logson Group and the new owners have decided to continue to support the charity. To announce the news, the Cardboard Box Company created a Bubble Rush backdrop using their digital printing facilities. This will be in situ on the day at Pleckgate High School for people to have their ‘before’ and ‘after’ photos taken next to it. The event will include different coloured bubble checkpoints to run through for plenty of foamy fun, plus a few surprises along the way. The run can be one lap of 2.5km or you can complete the circuit twice to make it 5km. Entry, which includes a t-shirt and medal, costs £20 for adults and £8 for children. There are currently a few earlybird places left priced £15 and £6 on a first come first served basis. The money you raise will help care for people from Blackburn, Darwen, Hyndburn and the Ribble Valley with life-limiting illnesses. East Lancashire Hospice offers a 10-bed inpatient unit for those who need it, day patient services, hospice at home care and bereavement support. For more information email Leanne Green or call fundraising on 01254 287 011.